Welcome to a scary new world where Kim Jong-Un has acquired the capability to fire a ballistic missiles over Japan. In light of the absence of American Leadership though the abdication of commitment on the part of the Trump Regime, Japan has come face to face with the realities of an aggressive neighbor bent on waging war. While Japan's populace abhors the idea of abandoning the pacifist constitution imposed by the Americans at the end of WWII, this weeks events that saw three North Korean missiles fly over Hakodate should serve as a wake up call that Japan must scrap Article 9 and mobilize its forces to meet this crisis. While the United States Navy has pledged to honor its long term commitments to the defense of Japan, neither the Self Defense Forces or the United States do anything to stop these missiles from violating Japanese airspace. 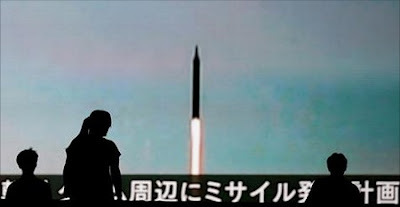 Had those missile been armed and malfunction or worse deliberately targeting Sapporo, Japan would have no choice but to defend herself which would almost certainly guarantee retaliation that would plunge the region into war. We have stated many times we do not want war. At the same time we feel that to prevent a war one must have a strong defense. Article 9 limits Japan's capability to do that. This must change regardless of what protests Beijing sends Tokyo's way. The Belligerents of North Korea don't care about how Japan feels about the past. They want to prove they can hurt their one time colonial masters and thanks to their recent acquisition of technology allegedly from the Ukraine, Japan must act. This is about protecting Japan and right now Japan is threatened. I hope that PM Abe will push for stronger measures to protect Japan. But scraps of paper are not enough. It's up to the Japanese people. We hope they have heard this wake up call and will move towards a stronger defense to protect those they love.